This guest post is by Carbon News editor Adelia Hallett, published with permission. New Zealand will face droughts, floods, fires, social upheaval and catastrophic global economic damage if the world follows the country’s lead on cutting greenhouse gas emissions, says one of our leading climate experts. Dr James Renwick – Professor of Physical Geography at Victoria University, an International Panel on Climate Change lead author, and formerly a principal scientist at the National Institute on Water and Atmosphere – says that cutting emissions at the rate that New Zealand proposes would lead to at least 3 degrees of warming by the end of the century. That’s warmer than at any time in the history of human agriculture and settlement, which started around 10,000 years ago. The Government announced on Tuesday that New Zealand would go to international climate change negotiations in Paris later this year with a post-2020 emissions reduction target (known as an Intended Nationally Determined Commitment, or INDC) of 30 per cent below 2005 levels by 2030. That’s the same as 11.2 per cent below 1990 levels. 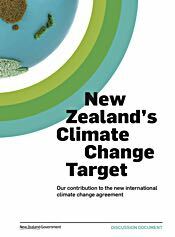 New Zealand also has a target of halving emissions on 1990 levels by 2050.